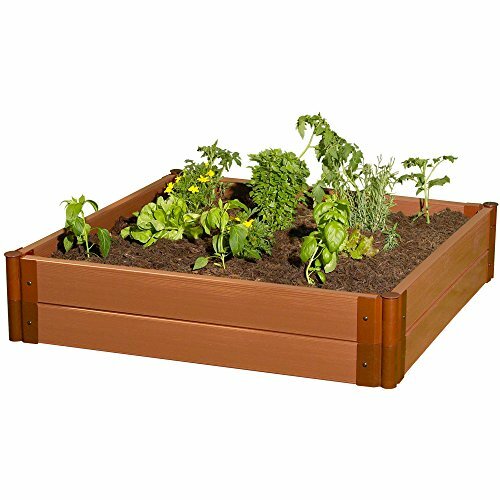 Frame It All Composite Raised Garden Bed Kit, 4' by 4' by 11"
Frame It All - Simple Modular Gardens. The gardens that grow with you. The Two Inch Series 4ft. x 4ft. x11in. Composite Raised Garden Bed Kit can be used as a stand-alone raised garden bed or as a module to extend any Frame It All Raised Garden Bed System. If your love of gardening runs deep, you'll appreciate the extra soil depth the 4ft. x 4ft. x 11in. kit provides. Almost any type of crop will do well in an 11in. bed - even root vegetables. Patented anchor joint allows installation on hard surfaces (such as rooftops, patios or decks) and traditional soft surface landscapes. Bold 2in. profile timbers create more perceived value for your landscaping investment. With 16 square feet of available planting area you'll find many uses for this versatile kit. Color: 4' by 4' by 11"